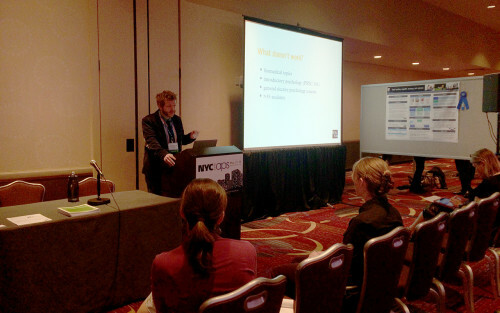 Wiki Ed’s Ryan McGrady speaks during a presentation at the APS Annual Convention. The Association for Psychological Sciences was one of the first academic associations to see the potential for an initiative promoting the improvement of content on Wikipedia. In 2011, they kicked off their APS Wikipedia Initiative, and four years later, it’s still going strong. In May, Wiki Education Foundation staff attended the APS Annual Convention to talk with APS members about furthering our engagement. We’ve found it is extremely challenging for courses to make positive contributions to psychology articles on Wikipedia when they operate outside of these criteria. Courses that don’t fit these four categories were discouraged from participating in the Classroom Program, but we’re excited to engage psychology experts in other ways. The idea of focusing on courses like the history of psychology was particularly well-received at the APS Convention. Many of the instructors we spoke with thought the Wikipedia assignment in this class was a much more useful assignment compared to a traditional poster project — and provides students an opportunity to help close Wikipedia’s gender gap by writing articles on women psychologists. The APS Wikipedia Initiative, though, is about more than just teaching with Wikipedia. Their goal is to improve the content publicly available about psychology research, and so they see potential in both the Classroom Program’s high-level courses that can make a big difference as well as in calling on APS members (professors and graduate students) to edit Wikipedia themselves. To support this initiative, we’re starting a small pilot this summer, in which Wiki Ed staff will lead a Summer Seminar. In this four-week program, APS members who are interested in editing Wikipedia articles will take a course on how to contribute. Convention attendees were particularly excited about this, and several have followed up with us to find out more about the project. Preliminary conversations suggested we should spend a significant amount of time on Conflict of Interest, as many members wanted to write about their research; when staff explained Wikipedia’s policies forbidding this, however, members were amenable to focusing on other topics instead. Our goal for the seminar is for experts to learn how to edit psychology articles on Wikipedia and contribute high quality work throughout the program. APS is hopeful that the Summer Seminar will not only improve quality of Wikipedia articles on psychology but also identify members who could support the development of content gap lists in psychology, indicating whether the article needs an expert to expand (making it something for a potential second Seminar to tackle) or whether it could be appropriate for a student editor from the Classroom Program. We will post more information about the Summer Seminar as it gets underway later this summer.